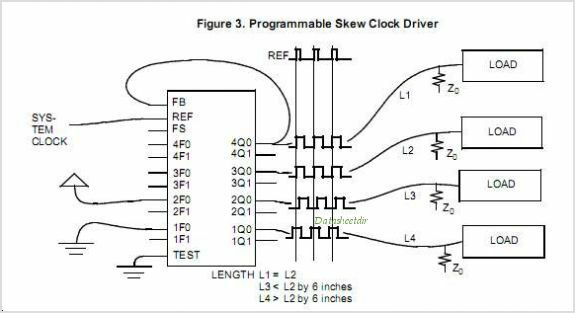 The CY7B991V Low voltage Programmable Skew Clock Buffer (LVPSCB) offers user selectable control over system Clock functions. These multiple output Clock Drivers provide the system integrator with functions necessary to optimize the Timing of high-performance computer systems. Each of the eight individual drivers, arranged in four pairs of user controllable outputs CAN drive terminated transmission lines with impedances as low as 50. This delivers minimal and specified output skews and full swing Logic levels (LVTTL). By Cypress Semiconductor Corp. This is one package pinout of CY7B991V,If you need more pinouts please download CY7B991V's pdf datasheet. 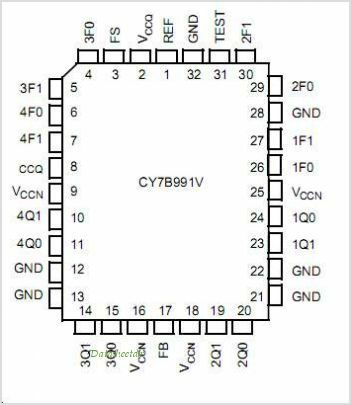 This is one application circuit of CY7B991V,If you need more circuits,please download CY7B991V's pdf datasheet.